According to the 2014 Census Bureau, there are approximately 21.8 million veterans in the United States (US). All of these service members served their time and earned the title “United States Veteran.” This title is honorable and only carried by approximately 14% of documented people living in the United States. A veteran is defined as “a person who served in the military, naval, or air service, and who was discharged or released therefrom under conditions other than dishonorable” (“Legal Information Institute”). Each and every one of these people dedicated a period of time to serving our country whether it was voluntary or not. 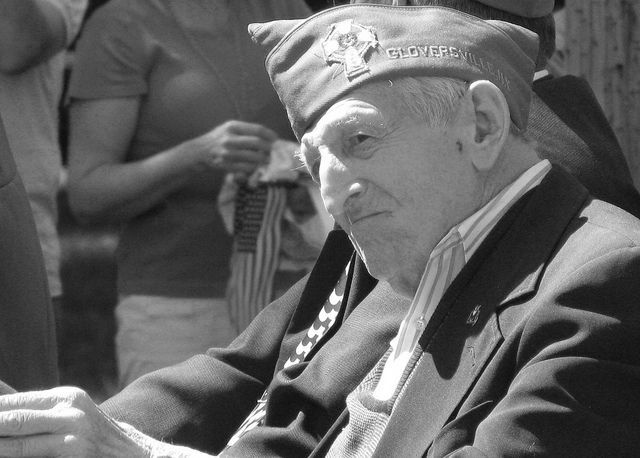 Veterans (vets) dedicated too much for the country to not be honored for their contributions. When they return from war and their obligation has been completed, they have the right to use the Veteran Affairs (VA) health care system for medical care. This system has many resources available for our vets. Mental health specialists, emergency medicine, primary care doctors, oncology departments, support groups and a free pharmacy are just a few of the benefits they offer. The problem is getting an appointment to use any of these benefits because there aren’t enough facilities to accommodate all the veterans. The VA healthcare facilities have been under the microscope for unethical behavior and mistreatment of their patients. Every veteran in the United States deserves to be taken care of properly as well as receive full benefits one-hundred percent of the time at any healthcare facility. Supporting and defending the Constitution of the United States of America is no easy task. The men and women who put themselves in harm’s way to protect our people are bound to get a few injuries every now and again. The VA offers 100% coverage for all “service related” injuries and a cost share for any injuries that are deemed “non-service related,” but only at a VA health facility. The full coverage and even the cost share are at a fair rate, based on your yearly annual salary. Many people would agree that the system seems to have a great grasp on the idea of taking care of our veterans’ health needs. The programs they offer are constantly changing to stay up to date with today’s veterans’ needs and medical facilities have been updated to accommodate most treatment. The issue the system runs into is they do not have the facilities and staff to accommodate the medical needs in a timely manner. In some cases it could take up to a month to see your primary care doctor for a physical and even longer for an appointment concerning an operation or a specialist consultation. In Phoenix, Arizona, Richard Griffin, the acting VA Inspector General, uncovered 17 veterans who died while waiting for care at the healthcare facilities (Thompson). Although the evidence is not clear that waiting for the treatment caused the deaths, it’s too coincidental to fully disqualify that outlook. The deeper they looked into the VA healthcare appointment wait times, the more wrongdoing they started to discover. Some VA workers even started to come forward admitting to their wrongdoings, hoping to save their names and careers (Thompson). The workers were instructed to hold appointments on an unofficial waiting list for days before being put into the system on the actual tracking board. Another unethical way they were “cooking the books” was by cancelling appointments, listing them as being done by the patient then making a new appointment on the waiting list days later. Some were so dedicated to making the numbers look good instead of getting the veterans the help they needed that they found a glitch in the system. This system error made the patient hide in the system. By placing the appointment date to “next available date,” it would not fall on the tracking board, so the long wait time couldn’t be tracked by anyone who did not look directly at the medical records (VA Office of Inspector General). This is not the way any person who was willing to dedicate precious years of their life to protecting our freedom in the United States of America should be treated. Opening up veterans’ health care to non-VA run facilities would definitely cost a lot of money, but the cost should not even be an issue. There is no reason any person who fought for this country should have to live in pain after giving so much for the greater good. The program should be run exactly like the Connecticut-based Husky Program but with a cost share equal to VA cost share for people who make too much money for free services. Some argue that the cost of giving veterans free medical at any facility would cost the government entirely too much money. They are correct that the medical cost would increase slightly but if vets were able to go to regular medical facilities the money allotted to the VA, and mishandled by the VA, could be dispersed in other avenues. If managed correctly, all veterans will have the proper medical attention they have earned and the VA leaders and advisors will be able to conduct business at a manageable level. Properly taking care of a veterans medical needs should be a top priority in the United States of America, “Our debt to the heroic men and valiant women in the service of our country can never be repaid. They have earned our undying gratitude. America will never forget their sacrifices” (President Harry S. Truman). Most Americans don’t even realize that on a daily basis America is being evaluated by other countries. Many countries love us but some are waiting to see a time of weakness so they can strike and challenge us on our own land. The brave men and women who put their lives on the line, whether in combat or not, dedicate their lives to keeping America free and this is why we, as Americans, owe it to them to take care of all veterans once their service is done. Opening all healthcare facilities, instead of making them wait until it is too late at a VA facility, is one way we can honor our veterans. “Legal Information Institute.” Cornell University. U.S. Code Title 38 Part 1. (2015). 17 October 2016. Thompson M. “It’s Time For Some Perspective on the VA.” Time.com [serial online]. May 23, 2014;:1. Available from: Academic Search Premier, Ipswich, MA. Accessed October 23, 2016. VA Office of Inspector General. “Review of Alleged Patient Deaths, Patient Wait Times, and Scheduling Practices at the Phoenix VA Health Care System.” 14-02603-267.8.26 (2014):1-133.pag.Web. 19 October 2016. Instructor comments: Nick’s paper is outstanding because it has a clear direct point that he coherently upholds and promotes throughout the body of his paper. It is thoughtful, sincere, and well written. It is a point of view sincerely held by the writer who does his best to present his subject matter in a clear, objective manner. Photo credit: “Veteran” by Ias – initially. Licensed through Creative Commons. Should We Be Following Other Countries in the Proper Disposal of Nuclear Waste?